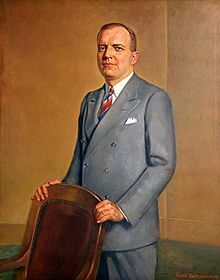 Harold Edward Stassen (April 13, 1907 – March 4, 2001) was the 25th Governor of Minnesota. He was a leading candidate for the Republican nomination for President of the United States in 1948, considered for a time to be the front-runner. He thereafter regularly continued to run for that and other offices, such that his name became most identified with his status as a perennial candidate. West St. Paul, Minnesota, U.S.
Born in West St. Paul, Minnesota, Stassen was elected as the district attorney of Dakota County, Minnesota after graduating from the University of Minnesota. He won election as Governor of Minnesota in 1938. Stassen was then and remains the youngest person elected to that office. He gave the keynote address at the 1940 Republican National Convention. He resigned as governor to serve in the United States Navy during World War II, becoming an aide to Admiral William Halsey Jr. After the war, he became president of the University of Pennsylvania, holding that office from 1948 to 1953. Stassen sought the presidential nomination at the 1948 Republican National Convention, winning a significant share of the delegates on the first two ballots of the convention. During the Republican primaries preceding the convention, he engaged in the Dewey–Stassen debate, the first recorded debate between presidential candidates. Stassen sought the presidential nomination again at the 1952 Republican National Convention, and helped Dwight D. Eisenhower win the nomination by shifting his support to Eisenhower. After serving in the Eisenhower administration, Stassen sought various offices. Between 1958 and 1990, he campaigned unsuccessfully for the positions of Governor of Pennsylvania, Mayor of Philadelphia, United States Senator, Governor of Minnesota, and United States Representative. He further sought the Republican nomination for president in 1964, 1968, 1976, 1980, 1984, 1988, and 1992. Stassen, the third of five children, was born in West St. Paul, Minnesota, to Elsie Emma (née Mueller) and William Andrew Stassen, a farmer and several-times mayor of West St. Paul. His mother was German and his father was born in Minnesota, to German and Czech parents. He graduated from high school at age 14. At the University of Minnesota, Stassen was an intercollegiate debater and orator, and captain of the champion university rifle team in 1927. He received his B.A. degree in 1927, and his LL.B. degree in 1929. That year, he married his wife, the former Esther Glewwe, whose sister, Martha, was married to Harold's younger brother, William. After opening a law office with Elmer J. Ryan in South St. Paul that year, he was elected District Attorney of Dakota County in 1930 and 1934, then elected Governor of Minnesota in 1938. Stassen was seen as an "up and comer" after delivering the keynote address at the 1940 Republican National Convention. There he worked to help Wendell Willkie win the Republican Party (GOP) nomination for the presidency. Stassen, who was reelected as governor of Minnesota in 1940 and 1942, supported President Franklin D. Roosevelt's foreign policy and encouraged the state Republican Party to repudiate American isolationism before the attack on Pearl Harbor. During the 1942 campaign, he announced that, if re-elected, he would resign to serve on active duty with the United States Naval Reserve, which Stassen had joined with the rank of lieutenant commander earlier that year. 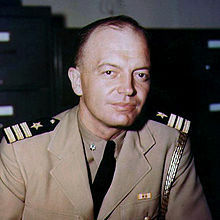 After being promoted to the rank of commander, he joined the staff of Admiral William F. Halsey, Commander of the Third Fleet in the Pacific Theater. He was awarded the Legion of Merit for meritorious service in this position. After almost two and a half years of service, he was promoted to the rank of captain on September 27, 1945 and was released from active duty in November of the same year. Stassen lost some of his political base while overseas, whereas Republican candidates such as Thomas E. Dewey had a chance to increase theirs. Stassen was a delegate at the San Francisco Conference that established the United Nations, and was one of the US signatories of the United Nations Charter. He served as president of the University of Pennsylvania from 1948 to 1953. His attempt to increase the prominence of the university football team was unpopular and soon abandoned. From 1953 to 1955, he was the director of President Dwight D. Eisenhower's short-lived Foreign Operations Administration. Stassen was later best known for being a perennial candidate for the Republican Party nomination for President of the United States, seeking it nine times between 1944 and 1992 (1944, 1948, 1952, 1964, 1968, 1980, 1984, 1988, and 1992). He never won the Republican nomination, much less the presidency; in fact, after 1952, he never even came close, but continued to campaign actively and seriously for President until just a year before his death. U.S. Representative (he was the Republican nominee against Bruce Vento of Minnesota in 1986). Stassen's strongest bid for the Republican presidential nomination was in 1948, when he won a series of upset victories in early primaries. His challenge to the front runner, New York Governor and 1944 G.O.P. presidential nominee Thomas E. Dewey, was serious enough that Dewey challenged Stassen to a debate on the night before the Oregon Republican primary. The May 17 Dewey–Stassen debate was the first recorded modern debate between presidential candidates to take place in the United States. The debate, which concerned the criminalization of the Communist Party of the United States, was broadcast over the radio throughout the nation. At the convention in Philadelphia, Osro Cobb, the then Republican state chairman in Arkansas, made a seconding speech for Stassen, having been motivated by Stassen's promise if nominated to campaign actively in the South. Cobb described the South as "the last frontier to which we can turn for substantial gains for our party - gains that can be held in the years to come. There is a definite affinity between the southern farmer and the grassroots Midwestern Republicans. ...Our party simply cannot indulge the luxury of a Solid South, handed on a silver platter to the opposition every four years...."
In the first two rounds of balloting, Stassen finished third behind Dewey, the front runner, and Robert Taft. After the second round, Stassen and Taft bowed out and Dewey was selected unanimously as the nominee on the next ballot. In all Republican conventions since 1948, the nominee has been selected on the first ballot. Stassen's home-state delegation played a key role in the 1952 Republican contest when, over his objection, his delegates were released to Dwight D. Eisenhower. This swing helped Eisenhower to defeat Robert A. Taft on the first ballot. He served in the Eisenhower Administration, filling posts including director of the Mutual Security Administration (foreign aid) and Special Assistant to the President for Disarmament. During this period, he held cabinet rank and led a quixotic effort (perhaps covertly encouraged by Eisenhower, who had reservations about Richard Nixon's maturity for the presidency) to "dump Nixon" at the 1956 Republican Convention. After leaving the Eisenhower Administration, Stassen campaigned unsuccessfully for governor of Pennsylvania (1958 and 1966) and for mayor of Philadelphia (1959). In 1978, Stassen moved back to Minnesota and ran a campaign for the U.S. Senate. In 1982, he campaigned for the Minnesota governorship and in 1986 for the fourth district congressional seat. He campaigned for the Republican Party presidential nomination in every election except 1956, 1960, and 1972. He was on the ballot in the 1988 Republican New Hampshire Primary and received 130 votes, and also received 1 vote in the Democratic Primary. Raised as a Baptist, Stassen was active with regional Baptist associations as well as many other religious organizations. During the 1960s, he gained a reputation as a liberal, particularly when, as president of the American Baptist Convention in 1963, he joined Martin Luther King in his march on Washington, D.C. Much of Stassen's political thought came from his religious beliefs. He held important positions in his denomination and in local and national councils of churches. In the latter 1960s and early 1970s, Stassen also participated with the U.S. Inter-religious Committee on Peace, which sponsored a series of conferences on religion and peace. Baptists writing memorials remembered him as much as a church figure as a political candidate. His son Glen Stassen was a prominent Baptist theologian. On the death of Happy Chandler, Stassen became the earliest serving governor of any U.S. state still living. When he died, the title was passed to Charles Poletti, a former governor of New York State. Stassen died in 2001 in Bloomington, Minnesota, at the age of 93 and is buried at the Acacia Park Cemetery in Mendota Heights, Minnesota. The Minnesota Department of Revenue headquarters near the State Capitol is named for him. Commander Harold E. Stassen, United States Navy, is awarded the Legion of Merit for exceptionally meritorious conduct in the performance of outstanding services to the Government of the United States as Assistant Chief of Staff, Administration, and Aide and Flag Secretary on the staff of Commander, THIRD Fleet, from 15 June 1944 to 26 January 1945. In the Lord of the Rings parody Bored of the Rings, the "Bath of Lavalier" (which parodies the Mirror of Galadriel in The Fellowship of the Ring) is shown predicting a happy ending for all concerned, and Lavalier says that it bodes well, because the Bath of Lavalier never lies. After the characters leave, the Bath of Lavalier is described as showing "the triumphant reception of the RMS Titanic in New York Harbor, the repayment of the French war debt, and the inaugural ball of Harold Stassen." Stassen appears in Harry Turtledove's alternate history novels Colonization: Aftershocks (part of the Worldwar series) and Joe Steele (a standalone). In the ninth episode of the 18th season of The Simpsons, while staying with the titular family, Gil Gunderson makes breakfast and asks the kids "Who wants some eggs à la Harold Stassen?" When met with dumbfounded looks, he reveals the punchline: "They're always running!" In Elia Kazan's 1947 movie Gentleman's Agreement starring Gregory Peck, the lead character played by Peck mentions early in the film his disappointment with being assigned to write on antisemitism by his magazine editor. Peck's character mentions he feels his first assignment should involve some theme of import, such as "covering Stassen". This is presumably a reference to the then looming 1948 United States presidential election Republican party primary nomination which Stassen and Thomas E. Dewey were both then in heated competition to win. Gunther, John (1947). "Stassen: Young Man Going Somewhere". Inside U.S.A. New York, London: Harper & Brothers. pp. 293–308. Pietrusza, David 1948: Harry Truman's Improbable Victory and the Year that Changed America, Union Square Press, 2011. Smemo, Kristoffer. "A "New Dealized" Grand Old Party: Labor and the Emergence of Liberal Republicanism in Minneapolis, 1937–1939." Labor: Studies in Working-Class History of the Americas (2014) 11#2 pp: 35-59. Werle, Steve, Stassen Again, (St. Paul: Minnesota Historical Society Press), 2015. In the Harold E. Stassen Papers at the Minnesota Historical Society, digital content is available for researcher use. Researchers will find content that includes speech files, handwritten notes, memoranda, annotated briefings, correspondence, war diaries, working papers, and draft charters for the United Nations. The entire Harold E. Stassen collection includes campaign and political, naval service, United Nations, Eisenhower administration, and organizational membership files of the Minnesota Governor (1938–1943), Naval Officer (1943–1945), United Nations delegate (April–June 1945), Presidential contender (1948), and Eisenhower cabinet member and Director of the Mutual Security Agency (1953–1958), documenting most aspects of Stassen's six-decade career, including all of his public offices, campaigns, and Republican Party and other non-official activities. Digital selections from this manuscript collection were made based on user and researcher interest, historic significance, and copyright status. ^ a b c "Guide, Harold Edward Stassen Papers, 1940–1957, 1914–1919, University of Pennsylvania University Archives". Archives.upenn.edu. Retrieved October 19, 2010. ^ Krebs, Albin (March 5, 2001). "Harold E. Stassen, Who Sought G.O.P. Nomination for President 9 Times, Dies at 93". The New York Times. Retrieved May 4, 2010. ^ a b c d "Governor Stassen". Life. October 19, 1942. p. 122. Retrieved November 21, 2011. ^ Mayer, Michael S. (2010). The Eisenhower Years. New York, NY: Facts on File. p. 723. ISBN 978-0-8160-5387-2. ^ "Esther Ethel Glewwe Stassen (1906-2000) - Find A..." www.findagrave.com. Retrieved August 29, 2018. ^ a b "Captain Harold E. Stassen, USNR, (1907–2001)". Department of the Navy – Naval Historical Center. March 10, 2001. Retrieved January 15, 2010. ^ a b c Krebs, Albin (March 5, 2001). "Harold E. Stassen, Who Sought G.O.P. Nomination for President 9 Times, Dies at 93". The New York Times. ^ "American President". Millercenter.org. Archived from the original on October 6, 2014. Retrieved October 6, 2014. ^ a b "Governors of Minnesota". Mnhs.org. Retrieved October 6, 2014. ^ "Valor awards for Harold E. Stassen". Military Times. Retrieved August 15, 2017. ^ "MN Governor Race – Nov 08, 1938". Our Campaigns. Retrieved October 19, 2010. ^ "MN Governor Race – Nov 05, 1940". Our Campaigns. Retrieved October 19, 2010. ^ "MN Governor Race – Nov 03, 1942". Our Campaigns. Retrieved October 19, 2010. ^ "US President – R Primaries Race – Feb 01, 1944". Our Campaigns. Retrieved October 19, 2010. ^ "US President – R Primaries Race – Feb 01, 1948". Our Campaigns. Retrieved October 19, 2010. ^ "US President – R Convention Race – Jun 21, 1948". Our Campaigns. Retrieved October 19, 2010. ^ "US President – R Primaries Race – Feb 01, 1952". Our Campaigns. Retrieved October 19, 2010. ^ "PA Governor- R Primary Race – May 20, 1958". Our Campaigns. Retrieved October 19, 2010. ^ "Philadelphia Mayor Race – Nov 03, 1959". Our Campaigns. Retrieved October 19, 2010. ^ "US President – R Primaries Race – Feb 01, 1964". Our Campaigns. Retrieved October 19, 2010. ^ "PA Governor- R Primary Race – May 17, 1966". Our Campaigns. Retrieved October 19, 2010. ^ "US President – D Primaries Race – Mar 12, 1968". Our Campaigns. Retrieved October 19, 2010. ^ "MN US Senate- R Primary Race – Sep 12, 1978". Our Campaigns. Retrieved October 19, 2010. ^ "US President – R Primaries Race – Feb 17, 1980". Our Campaigns. Retrieved October 19, 2010. ^ "US President – R Primaries Race – Feb 20, 1984". Our Campaigns. Retrieved October 19, 2010. ^ "MN District 4 Race – Nov 07, 1986". Our Campaigns. Retrieved October 19, 2010. ^ "US President – R Primaries Race – Feb 01, 1988". Our Campaigns. Retrieved October 19, 2010. ^ "US President – R Primaries Race – Feb 01, 1992". Our Campaigns. Retrieved October 19, 2010. ^ "MN US Senate – R Primary Race – Sep 13, 1994". Our Campaigns. Retrieved October 19, 2010. ^ "Harold E. Stassen: An Inventory of His Papers at the Minnesota Historical Society". Mnhs.org. Retrieved October 6, 2014. Booknotes interview with Stassen on Eisenhower: Turning the World Toward Peace, October 14, 1990.